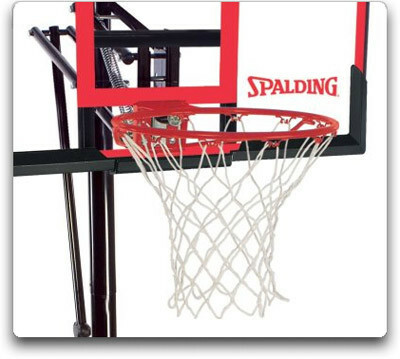 Model 72354 is the perfect intermediate Spalding basketball goal. The bright backboard graphics are a favorite among youth. The clear board provides the professional experience and the adjustment mechanism means dunk contests and rim height that accommodates even the 6 year olds. 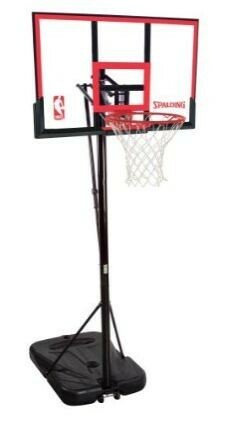 Make your home the place to play with this 72354 portable Huffy/Spalding basketball hoop for sale. Backboard material: transparent UV protected polycarbonate. Hardware Configuration: Pro Image Compression Spring for competitive dunking. Height adjustment name: Pro Glide. Metal mechanism on back of pole. 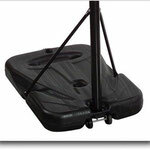 Adjustment Increments: Rim height adjusts from 7.5 feet to 10 feet in 6” increments. 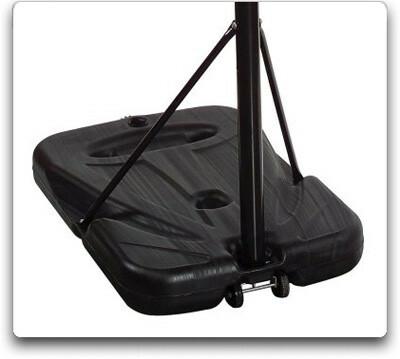 Base Material: High-impact blow molded plastic. Fill Material: 37 gallons of water or sand. Fill plug on top and drain plug on side for portability. About 50% of water must be drained to easily move around. Replacement caps available. Warranty: 5-years manufacturer’s warranty. Copy of receipt required. Rims and backboards damaged from falling over are not covered. Please ensure you follow the owner’s manual instructions to prevent the 72354 bball goal from falling over. 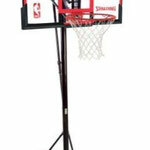 View Spalding 72354 48 In BB Basketball Systemon Competitive Edge Products, Inc for a low price guarantee option. View our directory of installers for help installing your Lifetime 72354. 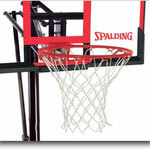 Download instructions for model 72354 Spalding goal. Here are the assembly instructions for the basketball spalding hoop model 72354.